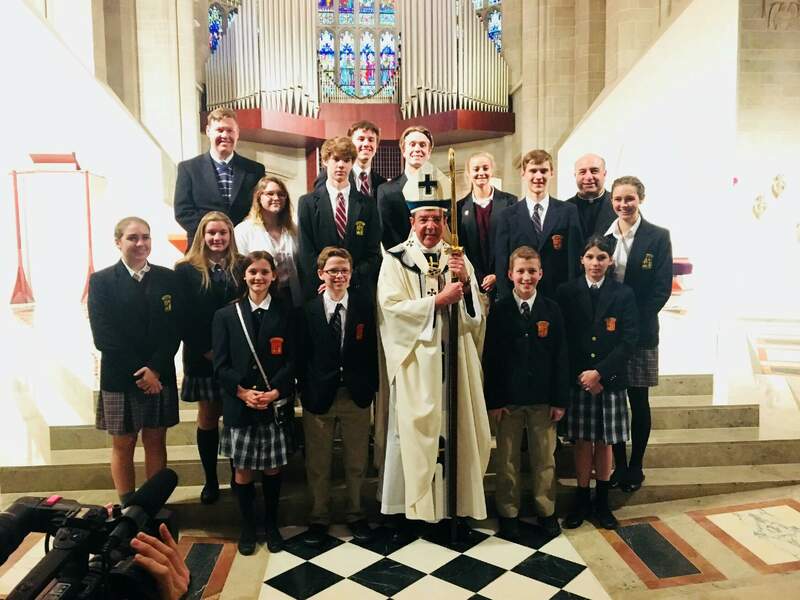 Joining representatives from Catholic schools throughout the Archdiocese of Detroit, 13 students from Everest attended the Catholic Schools Week Mass at Blessed Sacrament Cathedral on Thursday. The Mass is a traditional part of Catholic Schools Week in the Archdiocese and at Everest. The main celebrant, Archbishop Allen Vigneron, was joined by numerous priests from the other Catholic schools concelebrating. In his homily, the Archbishop invited the students to be protagonists in healing a wounded world, bringing all of God’s children back to Him. Everest students greeted the Archbishop and took a photo with him. Before heading back to school, they stopped at Panera for lunch. The students agreed experiencing Mass in the Cathedral with so many other young people was spiritually moving, and Everest is grateful to be a part of the community of the Archdiocese of Detroit as we celebrate “communities of faith, knowledge, and service” this Catholic Schools Week.